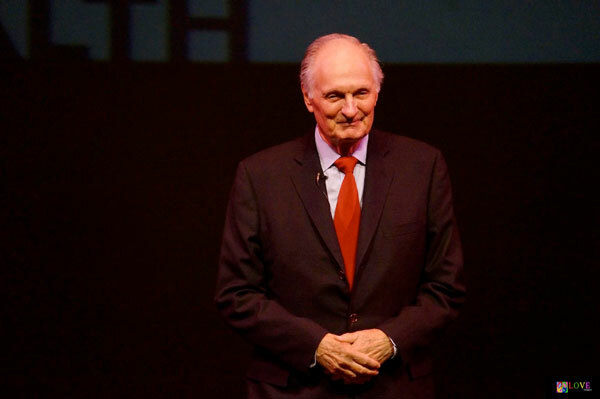 Alan Alda took the stage at Toms River, NJ’s Grunin Center for the Arts auditorium on Sept. 12, 2017 where he spoke to a sold-out crowd filled with medical professionals and community members on ways in which individuals can communicate more effectively with one another. Alda is not only well known for playing the iconic role of Hawkeye Pierce on CBS’s critically acclaimed television show, M*A*S*H, but for portraying Arnold Vinick on NBC’s political drama, The West Wing, in addition to hosting PBS’s science and technology series, Scientific American Frontiers. 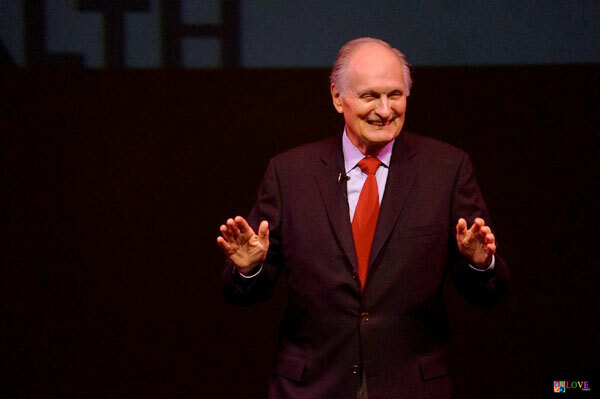 Alda has won seven Emmy awards, received three Tony nominations, and has also been nominated for an Academy Award for his role as Senator Owen Brewster in The Aviator. The author of several bestselling books including his latest publication, If I Understood You, Would I Have This Look on My Face? My Adventures in the Art and Science of Relating and Communicating, Alda appeared at the Grunin Center of Ocean County College at a fundraiser to support two local charities: Caregiver Volunteers of Central Jersey and the Friends’ Health Connection. Dr. Frank Vozos from R.W. Johnson Barnabas Health introduced Mr. Alda calling him an actor/writer/director who was born in the Bronx as Alphonso Joseph D’Abruzzo, explaining that his stage name, Alda, was created by combining the first two letters of his first and last names. A man with Jersey roots, we learn from Vozos that the entire time Alda was filming M*A*S*H in Hollywood, he was commuting back and forth each week from his home in the Garden State to avoid uprooting his family. 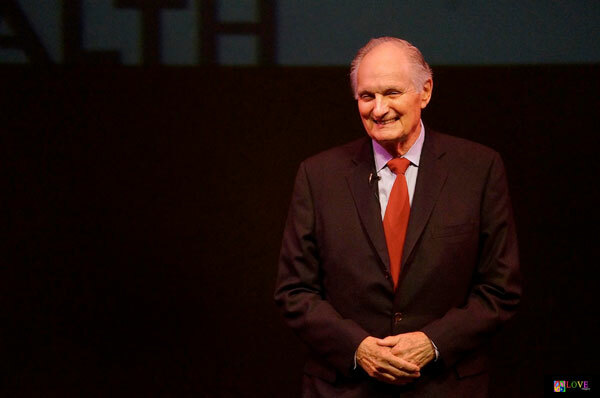 Taking the Grunin Center stage to warm applause, Alda tells a story about a time he became quite ill while filming Scientific American Frontiers. A doctor on the set who knew exactly what was wrong with Alda explained the abdominal procedure he would soon need to perform on him. When Alda — using knowledge he had learned from appearing on M*A*S*H — mentioned the technical name of the operation to the doctor, the physician was stunned and started to laugh. 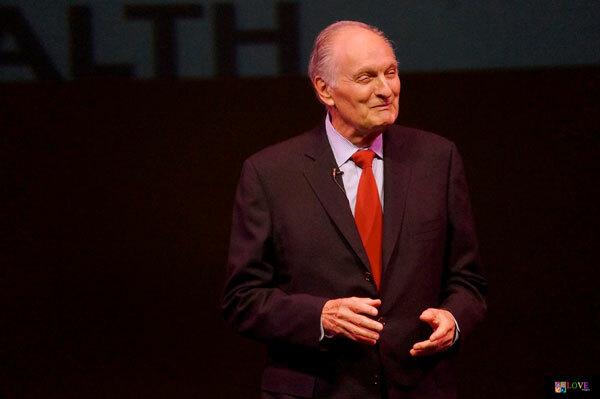 Alda notes that the lesson to be learned from this experience is that his doctor spoke to him in “absolutely plain language” — a lesson that all communicators — medical and otherwise — would do well to heed. During his talk, Alda discusses a phenomenon which he calls the “curse of knowledge” — a situation where potential communicators understand what it is they are trying to say so well that they often use technical jargon and/or speak too rapidly when attempting to get their points across. 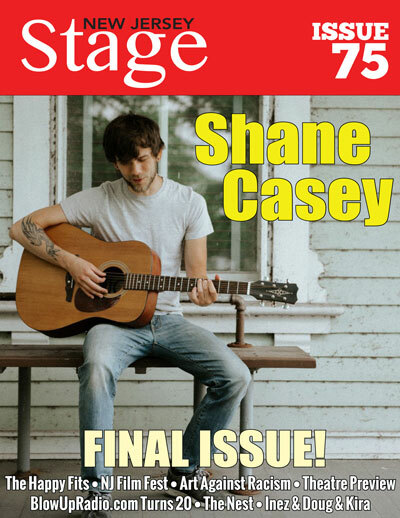 To demonstrate this phenomenon, he invites an audience member, Shawna, up to the stage. He asks Shawna to tap out a rhythm of any song she knows. According to Alda, the “curse of knowledge” — knowing the song so well — is what helped to make it so difficult for her to communicate it to the audience. To improve such communication, suggests Alda, “improvisation” and “coaching” can be employed. According to Alda, these are just two of the techniques currently used at the Alan Alda Center for Communicating Science at Stony Brook University’s School of Journalism in Stony Brook, NY. At the center, graduate students in the sciences and health fields are taught how to better communicate their expertise with patients and others. In addition to other suggestions like “slowing things down” and “making things personal,” Alda suggest that “empathy” is a significant component of effective communication. To illustrate, he invites another audience member, Joyce, to the stage. “Hi Joyce. I’m Alan Alda,” he says, clearly demonstrating his empathy. Alda engages in an acting exercise with Joyce where he moves his arms and Joyce mimics him. Then, the pair switches roles and Alda mimics Joyce’s movements. The exercise clearly shows audience members how to focus on another person and respond to him and her — a situation which Alda asserts requires empathy. In addition to empathy, Alda suggests that “knowing your audience” is also a key aspect to effective communication. By way of example, he tells a story about taking a trip to the Virgin Islands with his extended family. Spending some quality time hiking with his six-year-old grandson, Alda says the child happened to spot a tree which had unusual spikes on it instead of bark. When the youngster asked him to explain how this could have occurred, Alda says he commenced with a discussion on “evolution,” describing in grand detail all he knew about the topic. 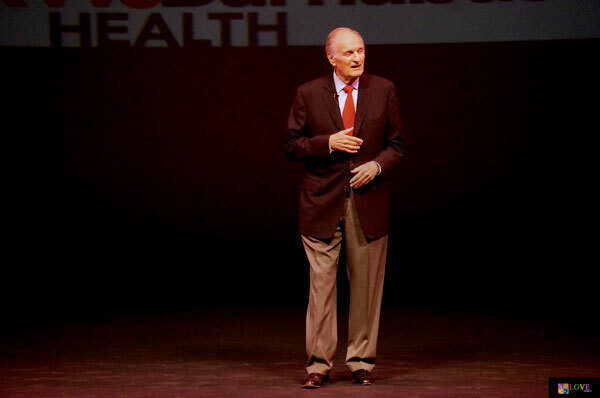 During a question and answer period, Alda was asked if playing Dr. Hawkeye Pierce on M*A*S*H had any influence on his work training medical professionals and other scientists to communicate more empathetically. For more information on Alan Alda — including information about his new book, If I Understood You, Would I Have This Look on My Face? My Adventures in the Art and Science of Relating and Communicating, please go to alanalda.com. To learn more about Caregiver Volunteers of Central Jersey, please click on caregivervolunteers.org. For further information on Friends’ Health Connection, please go to friendshealthconnection.org. 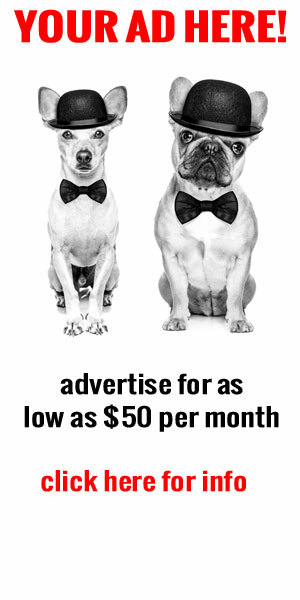 Lastly, to find out more about upcoming progamming at Toms River’s Grunin Center of the Arts — including Taxi and Who’s the Boss? star Tony Danza on Oct. 25 and Saturday Night Live star Anna Gastayer on Dec. 6 — please go to grunincenter.org.